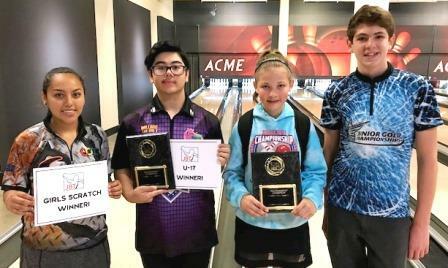 Ashton Yamasaki remained red hot to start the new season, while Payton Bower joined her brother as JBT champs, in exciting Pacific Northwest Conference action at Acme Bowl in Tukwila. Yamasaki was pretty dominant the day before at Secoma, but completely ran over the field on a totally different pattern here. After gaining the #1 seed in qualifying, he beat Bradley Baltazar and Brian DeLuisa-Anderson to return to the finals. He'd face Tommie McNeal, who recovered from a rough first game to qualify third, then beat Ethen Maxwell and Hunter Bower to reach the final. In the title game, both bowlers opened early, but Yamasaki got the bigger string going after that, and his 234-206 win was good for his third career JBT win, and second straight to open the season. Lennox bowled a very credible game in the finale, but Payton came up with a 209 scratch, her JBT career-high, to defeat Matthew and capture her first JBT title. Evan Smith has started the Priority Girls season red hot as well, this time beating Samantha Strehle to win her second straight event. Yamasaki completed his dream day with a win over Bud Sicard for the U17 event win. Big thanks to the team at Acme for hosting our Tour. Want in on all the fun and action for all ages? Just check out our schedule and come on down!